Is a Farmer an Entreprenuer? The entrepreneur shifts resources out of an area of lower and into an area of higher productivity and greater yield. Is a Farmer an Entrepreneur? It’s the beginning of another semester, and I typically have an early discussion in a course I teach on the nature of entrepreneurship. What is entrepreneurship? Who is the entrepreneur? What is the entrepreneurship process? What are the characteristics, skills and behaviors of entrepreneurs? The reaction tends to vary depending upon the student’s perspective. One set of students usually responds that yes, farmers are entrepreneurs. Farmers work for themselves. Farmers typically assume significant financial risk. Farmers make most decisions with only themselves to blame if things turn out poorly (or perhaps the weather). All are good points. Now the discussion is getting interesting. So doing something ‘new’ is an important distinction in determining whether someone is an entrepreneur? This discussion hearkens back to a chart I now draw for students, but that I’ve sketched out for aspiring entrepreneurs on napkins many times in the past as we share lunch or dinner and brainstorm about some opportunity or just about their own desire to break out on their own. The first way I use this chart is as a simple means to classify a new business idea. Where does it fit on a continuum of a business entering an 1) existing versus new market, and using an 2) existing versus new technology? As you move further out on each axis the risk becomes greater. A new market may develop or may not. A new technology may have superiority to existing alternatives and be attractive to customers, or it may not. 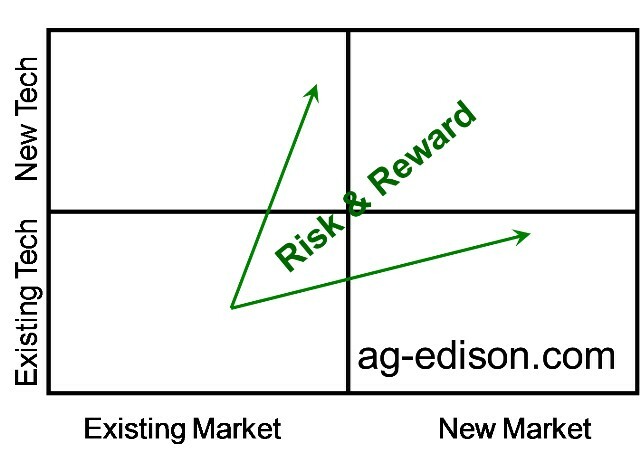 The way you view a new business and its inherent risks depend on where it falls on this chart. How an aspiring entrepreneur evaluates business model, potential partners, financing types, all these things depend at least partly where their business fits on this chart. Another pizza place in Campus Town in Ames probably fits into the lower left quadrant. It may have great pizza that enables it to compete effectively in the market, but it’s impact on the larger market is likely limited. A new technology in the agricultural GPS space, alternatively, may fit somewhere further upward and rightward. As risk increases, so do potential rewards. The Google guys weren’t the very first to create an Internet search engine, but they created the best new technology and business model in a new market, and have been rewarded handsomely. So as I lead a classroom discussion on whether a farmer is an entrepreneur, we ultimately veer toward some ideas on the ‘new.’ What represents innovation? What represents something new in the marketplace? If there is a difference between a farmer (or any small business person) and an entrepreneur, that difference has to do with introducing something new, moving an innovation forward in some way, shape, or form. I create a simple equation for the students. Those who move innovations forward are entrepreneurial, whether farmer, small business owner, inventor, community activist, or whatever. I don’t begrudge anyone, farmer or otherwise, who want to label themselves an entrepreneur. If they assume some level of independence and risk, I know how hard they likely work to succeed and applaud them for their efforts. Ultimately, however, I view the entrepreneur as someone with a package of traits that are utilized in many different contexts, even beyond business. For students in my classes, its about viewing entrepreneurship as a life skill. An entrepreneur is a person with entrepreneurial traits. These traits are life skills and, importantly for the students and others, they can be learned. Learned by watching, learned by imitation, and most fully, learned by doing.